Reykjavik has gained the attention of cruise ship operators more and more in recent years, resulting in 76 cruise ships visiting the Icelandic capital during the summer of 2010. The total passenger count is estimated to be around 70.000 people. The bigger ships will dock at Skarfabakki, located only 5 kilometers from the downtown area. 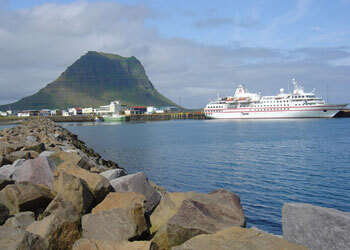 Other ships usually dock at Midbakki in the old harbor in downtown Reykjavik. Cruise ship stop time in Reykjavik is usually between 12-24 hours, only allowing visitors to enjoy the city and the nearby nature hotspots for a short time. Because of that, it is vital that visitors research the city and services offered before they reach land. Everyone should be able to find something to their liking in Reykjavik. If shopping is your thing, you should head to the downtown area where you'll find many small local design boutiques filled with clothing, jewelry, art and home decor. This is a great chance to explore the city center on foot, perhaps armed with a camera to capture some of the charm. Reykjavik is unique in many ways, as the city is very vibrant and there is unspoiled nature right at it's doorstep. Attractions such as Thingvellir national park, Gullfoss waterfall and Geysir hot spring area all within reach, and many excursion and taxi companies offer day tours to explore all of them in one day. If you prefer pure relaxation, you may want to take a trip to the Blue Lagoon. The blue lagoon is located in the Reykjanes peninsula, a 45 minute drive away from Reykjavik. The history and art buffs will not be let down by the city, as there are several history and art museums located in walking distance of the downtown area. Whatever you choose to do in Reykjavik, we hope that you get a chance to dine at some of the truly unique restaurants, many of which have made a name for themselves outside the volcanic island. Try the best of Iceland's fresh seafood and a taste of Nordic cuisine. Enjoy Reykjavik as much as you can in the short time you have, and start planning right away.